Pre Book your Almunecar taxi Transfers for €85 comfortably fitting four passengers, if you would prefer a larger vehicle we can provide a minivan for up to eight passengers at the modical price of €114 or maybe you would prefer a minibus for sixteen passengers and pay the amazing sum of €160, all our taxis and minibuses are fully licensed and insured, you are guaranteed safety and quality at a low cost rate, book your Almuñcar taxi now and pay your assigned driver after each journey, its so simple. 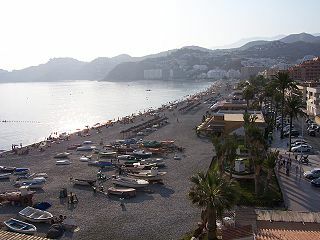 The Granada coast, on the shore of the Mediterranean, has one of the oldest towns on the so-called Tropical Coast. Of Phoenician origin, the former Sexi brings together a rich archaeological and monumental heritage with excellent beaches suitable for swimming, diving and a wide variety of water sports. It is an attractive coastal resort town with a subtropical climate and since 1975 it has become one of the most important tourist towns in Granada, this section of coast is now called the Costa Tropical. 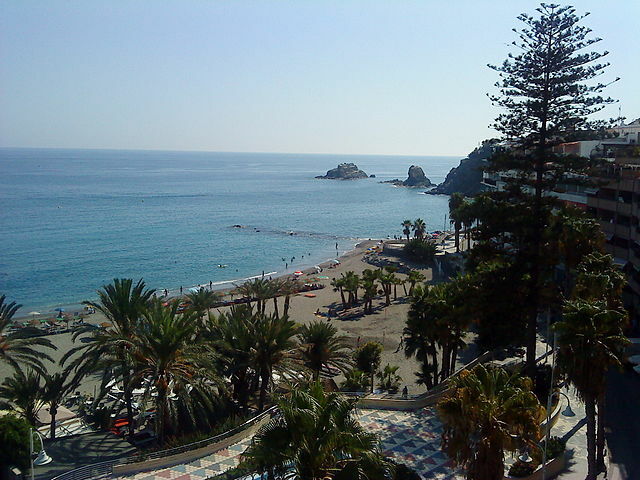 Almuñecar was founded by the Phoenicians 3000 years ago and like the rest of the coast has been invaded and occupied by the Romans, Moors and re-conquered by the Catholic Monarchs. 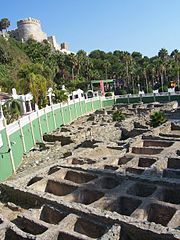 The magnificent remains of what was one of the most powerful civilizations in history can be contemplated by looking at the San Miguel Castle, an exceptional landmark in Almuñecar, apart from the San Miguel castle; there are many monuments on offer to tourists through which history is recreated. Setting off from this strategically placed fort which was used by diverse civilization, it is very easy to get lost in the traditional, cobbled streets, full of small squares, in which the remains of the Roman-Punic fish salting factory from the 4 th century B.C can be found. Authors like Martial or Estrabón make reference to this industry which, during centuries, exclusively supported the town‘s economy. It was an Empire which left signs of beauty in their town-planning, the Cueva de Siete Palacios being a prime example, which is made up of domes that now house the town‘s Archaeological museum. 2 Spain Transfers provide private costa tropical taxi transfers at low cost prices, Pre-Book from Malaga airport to Almunecar Taxi Transfers for €85 and pay your assigned driver at your destination, why risk reserving with another company, we provide fully licensed and insured taxis & minibuses, you are important to us that is why our suppliers are hand picked and have a strong track record on safe driving and punctuality, see what our happy clients have to say.